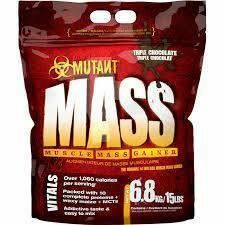 Mutant Mass is by far the ultimate weight gainer formula on the market. It's enhanced for massive results and is formulated to help you build that mutant muscle size and bone crushing strength. This product will exceed all of your expectations and will work in record time. The extensive scientific research and testing behind this product has revolutionized how weight gainers work, and set the bar so high very few products can come close. Every serving is powerful and packed with a potent dose of anabolic macronutrients. Mix or Shake 4 scoops of mutant mass into 16 to 32 fluid ounces of cold water or milk. You can enjoy Mutant Mass two or three times a day. For individuals who have a hard time consuming all 4 scoops in one sitting, you can easily split your shake into two shakes using two scoops each. You should take one shake first thing in the morning. If you have a training day it is a good idea to take another shake of Mutant Mass right after training. MUTANT TEST works through a premium dual-action pathway to maximize and protect your testosterone by A) inhibiting the aromatase enzyme and B) minimizing testosterone conversion to DHT (dihydroxytestosterone) — a male hormone linked to negative androgenic side effects. By inhibiting the aromatase enzyme complex, MUTANT TEST prevents aromatization and the conversion of testosterone to estrogen, minimizing unwanted side effects such as edema and gynecomastia. Secondly, MUTANT TEST then fights to protect your testosterone by inhibiting the 5-reductase enzyme, responsible for destroying your test and producing the unwanted metabolite DHT. The primary functional ingredient in MUTANT TEST, has been clinically evaluated using the Gold Standard method of research — a randomized, cross-over, double-blind, placebo-controlled study. Previously-trained test subjects consumed either a single-dose of MUTANT TEST’s primary ingredient or placebo and were evaluated over a 12-hour period. Subjects consuming the key ingredient in MUTANT TEST significantly increased total testosterone 376% over the placebo group in only 12 hours (Table 1 and Table 2). In the same published human-performance study, free ‘unbound’ testosterone increased by 144% change over the placebo group. Free unbound testosterone is the only form that can activate testosterone receptors for increased muscle growth and strength. In a randomized, cross-over, double-blind, placebo-controlled clinical study, previously-trained test subjects consumed the key ingredient found in MUTANT TEST and were evaluated over a 12-hour period. Subjects significantly increased total testosterone by 376% over the placebo group in only 12 hours. 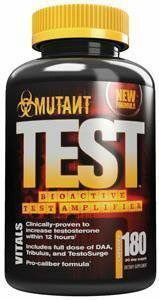 Nothing works faster to increase testosterone like new MUTANT TEST.